There is an Acton public exhibition to review plans and let Thames know your views. Specialists from the project team will be on hand to answer questions. The multi-billion project to reduce sewage overflow into the Thames will involved the construction of a super-sewer in Acton. In consultation documents released today by Thames Water more details of the scheme have been released showing that the Acton Storm Relief site on Warple Way will be the main construction site for local work in relation to the massive project. Part of the project involves connecting the local combined sewer overflow (CSO) at the Warple Way site, leading to the main tunnel of the proposed Thames Tunnel project. This will involve the building of a 2.6km tunnel which maps on the consultation document suggest will pass under Abinger Road, Welstead Way, Netheravon Road and Chiswick Mall. Thames are currently proposing to use land within their existing site on Warple Way near the recently completed Factory Quarter development for this construction work and to accommodate permanent structures required to operate the tunnel. It is envisaged that construction work on the site would last for around 2 years. The site of the former Chiswick Maternity Hospital on Netheravon Road South was identified as a potential site when the project was initially conceived as it was vacant, but since then planning permission has been given for the development of residential properties. It is no longer considered a viable option. The car park, Welstead Way was also considered but ruled out due to the difficulty of access and the potential disturbance to local residents. Originally, it was thought that sites like Homefield Recreation Ground, Ravenscourt Park or Dukes Meadows were being considered. In their consultation report, Thames Water say: “We currently envisage that the storm tanks would continue to operate during and after the construction of the Thames Tunnel project. “The proposed construction site is currently part of the Thames Water operational site, forming part of the grassed area at the southernmost tip. This selection has the advantage of using an existing Thames Water operational site. However, it is a significant distance from the proposed route of the main tunnel so we would need to build a connection tunnel of approximately 2.6km in length, requiring additional construction works. 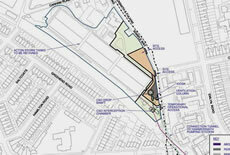 The site is also near to residential properties. “We would need to use the site as a construction site for approximately two years. The site would then be vacated as much as possible but a smaller area kept secure for subsequent equipment installation. The plan above shows the amount of space we think we would need to carry out the construction works but as the design of the Thames Tunnel develops further this could change. “Specific measures may be necessary to reduce the environmental effects of construction and we would welcome your views on the issues we should consider when developing our proposals. “We will be presenting our more detailed proposals in our second round of consultation before the submission of planning applications. It is from CSOs like the Acton Storm Relief that untreated sewage is discharged directly into the river. Thames Water claim that London’s mainly Victorian sewerage system, which was designed to transport both sewage and storm water is at or near capacity. Some CSOs discharge untreated sewage into the River Thames on average more than once a week and after only 2mm of rainfall. This situation is likely to become worse in the future, due to population growth and increased urbanisation. Starting in west London and broadly following the path of the River Thames through the centre of the capital, the main tunnel would transfer the flows from the most polluting CSOs to Beckton Sewage Treatment Works in the east of the city. Thames need a significant number of sites to construct the Thames Tunnel project. Large ‘shaft sites’ are required at certain points along the route to allow the construction of the main tunnel. Smaller ‘CSO sites’ are also required near each of the most polluting CSOs to connect them to the main tunnel. The publication of more details about the project represents the first round of public consultation on the project. Thames hope to have planning approval by 2012 and aim to start work in 2013 with completion in 2020. A spokesman for the company said: "Whilst we remain flexible, and will consider all suggestions made on the need for further exhibition venues, we currently feel the list we have proposed is sufficient. "Our consultation strategy has been developed in liaison with all the potentially directly affected local authorities, including Hounslow and Ealing."